It’s impossible to predict when a car fire may occur. However, you can take certain precautions to protect yourself and family from the frightening effects of a surprise vehicle fire. These precautions include equipping your vehicle with a fire safety first aid kit (which should include a fire extinguisher and wool or flame resistant blanket), knowing the common causes of vehicle fires and how to prevent them, as well as what to do to safely exit a vehicle in the event of a blaze. Immediately turn off the engine. Your engine could potentially provide heat, sparks, and fumes that can feed a fire. Ventilate the air. Carbon monoxide poisoning is one of the fastest-acting consequences of a fire. If you allow your car to fill with smoke, you may wind up passing out before you’re able to safely exit. Remember to crack a window to ventilate before doing anything else. Unbuckle yourself. Even though you may be more concerned about your passengers’ safety, you can’t help them if you’re constricted. Make sure you’re free from restraint and then help your passengers unbuckle. Exit the car quickly. You want to get as far away from the fire as possible to prevent smoke inhalation and burns. If you’re unable to exit, cover yourself and passengers with flame resistant blankets until help arrives. If a jammed door is preventing your escape, break the window you’ve already cracked to ventilate, and climb out through the opening. Move away from the car. Fumes, gasoline, and upholstery can ignite and potentially explode. Keep your distance, and do not return to the car once everyone has been safely evacuated. Try to keep onlookers away from the blaze as well until emergency vehicles arrive. For more information on vehicle fires and to learn about your injury claim options following a fire, contact our office today. Take advantage of our resources and skills, and allow us to help you pursue a strong claim. How common are burn injuries from a car accident? 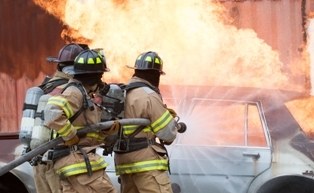 What emotional trauma typically occurs because of burn injuries? Post a Comment to "Tips to Escape Car Fires and Avoid Permanent Injuries"